We have now completed at least 3 full assessments using transects and quadrats with the help of our volunteers on our 12 sites around the estuary, including a number on the western shore. So we have a mass of data to collate and analyse and I have spent a busy time during the long, hot English summer (we are ‘swallows’) pulling this together and I am aiming to start producing reports in the new year. However ShoreSearch is not confined to counting quadrats – its aim is to record what lives and grows in the inter-tidal zone. Before we started the detailed assessments 3 or 4 years ago we also did ‘walk-overs’ of the areas around each site to get an overall view of biodiversity. Now we have finished the main assessments we are planning to repeat this. As we are travelling quite a lot before Christmas we will be doing most of this with our volunteers starting end January. But we took the opportunity of a low spring tide on October 10th to carry out a walk-over along the low tide line opposite Cearn Drive on Leisure Isle. The first thing we noticed was that what were extensive beds of seagrass in front of the seawall have almost disappeared, possibly smothered by rising sand levels – we hope they regenerate in the summer. We then made a number of interesting findings. Starting at the wreck marker pole we found plenty of life on the pole and lumps of ballast – a dense growth of algal turf hiding lumpy sea squirts, probably red bait Pyura stolonifera, with the tubes of fan worms poking through with large colourful sand anemonies Bunodactis reynaudi in the surrounding sand. 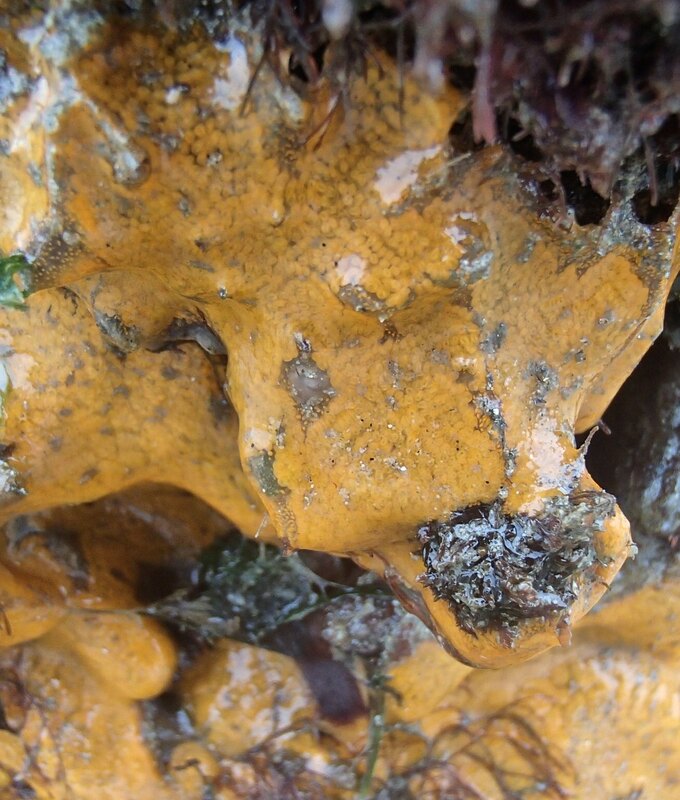 But most interesting was an extensive bright orange colonial sea squirt possibly the variable ascidian Botryllus gregalis on the seaward side of the pole. We also found this on mooring buoys off Cearn Drive. Walking toward Bollard Bay the sand was unremarkable apart from a few hermit crabs and smooth trough shells, mainly dead – until we found 3 live helmet shells, Semicasis labiate zeylanica, within 70 meters of each other – 2 were on the surface and 1 buried under the sand. This was a first – we have walked this area many times and never seen them. They were at least 70mm long, as big as they get according to 2 Oceans, and beautifully marked. These are predatory molluscs feeding on sea urchins and pansy shells. We saw quite a few of heart urchins Echinocardium cordatum partly buried and live – perhaps this has attracted them. Hitherto we have only ever found smaller ones as old shells inhabited by hermit crabs. Our second new find was numerous lumpy forms of solitary sea squirts, the siphon showing red stripes around the opening with knobbly papillae, which we identified as Hardmans redbait Pyura herdmani. A number of these had attached themselves to the tubes of moonshine worms , Diopatra neapolitana. Nearer Bollard Bay we found a very significant increase in the number of moonshine worms, Diopatra neapolitana. Their tubes, often decorated with shells and seaweeds, were closely massed together and covered much greater areas than previously observed. There is evidence that Diopatra may be an invasive species in which case such a dense population could be impacting the ecology of the bay. Not long after exploring what looked like a heel mark in the sand we uncovered a buried flat fish perfectly camouflaged in the sand ,250mm long. I flipped it into the sea and in a blink of an eye it had disappeared under the sand again. Unfortunately there is also some bad news – we saw evidence of bait pumping at 8 places well outside the permitted baiting area. We will be carrying out walk-overs at all the ShoreSearch sites in the new year and look forward to our volunteers joining us. We will publish a blog on each one.